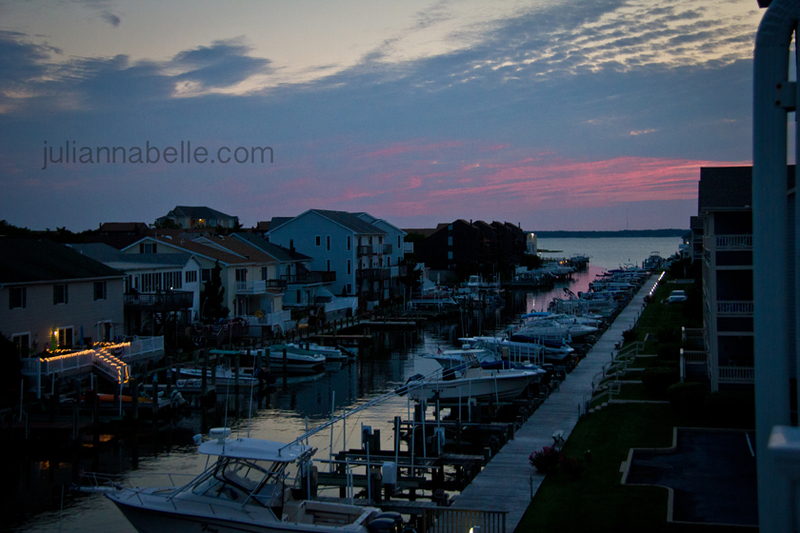 Last week, we were on vacation in Ocean City, Maryland (which explains my absence lately along with my inability to focus on blogging or catching up on blog reading!). I am going to break the pictures up into 2 post so I won't bore the life out of everyone. I edited most of my pictures with Lightroom. I seem to go through phases where I like using Photoshop only ... and then sometimes only Lightroom depending on my mood and the type of photos. I am not partial to either. I think both Lightroom and Photoshop have their own special places in the world depending on what you are trying to achieve. This time, I used mostly Lightroom to edit my raw shots and played around with some of the presets too. I did bring some into photoshop that needed some 'eye define' enhancements, but that's about it. P.S. I use & love THIS free action from Coffeeshop blog called "Perfect Portrait". It's a really sweet action to be able to boost the contrast overall, define the eyes and soften the skin quickly on any shot. I also decided to get back to using a watermark. I am obviously not a professional or even close. I am still very hobbyist and not very good actually. But... I saw a nice reminder on A Sorta Fairytale's blog about how important it is to watermark your photos always that you put out there online. I started doing it a while back, and it's really kind of a pain in the you know what because WHO HAS THE TIME? Not I! 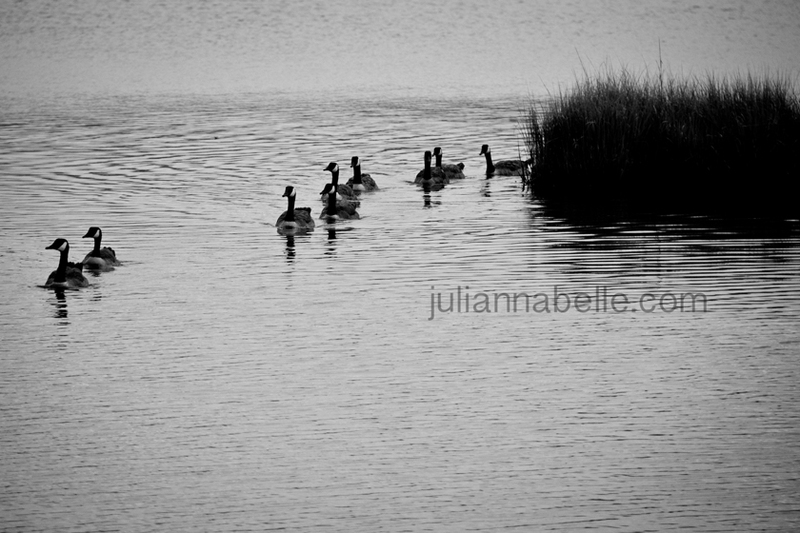 However, after reading THIS post on watermarking, it reminded me that anyone can steal Julianna's photos ... and let's face it, she is darned cute. So that does scare me. So... I'll try to watermark most of my stuff in the future for that reason. 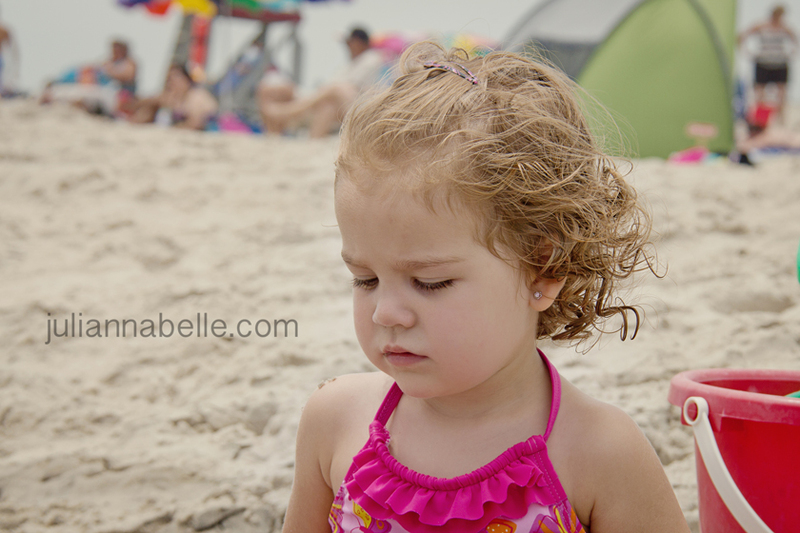 Julianna does not care for the sand - actually, she hates it. She freaks out if she touches it. She won't walk on it or touch it... I am told by other moms that she will grow out of this by next year's beach trip. Anyone else have this issue with their 2 year old? I sure hope so. 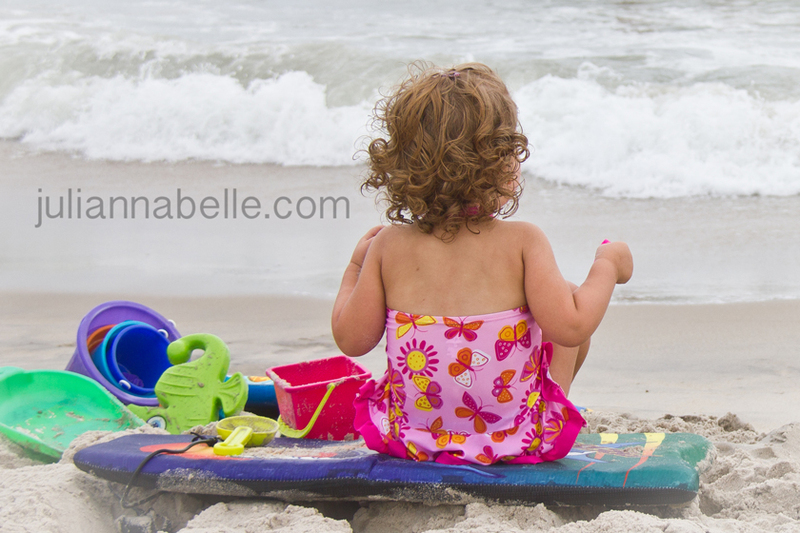 She was "OK" sitting on the boogie board ... as long as no part of her touched the sand. Oyyyy toddlers! 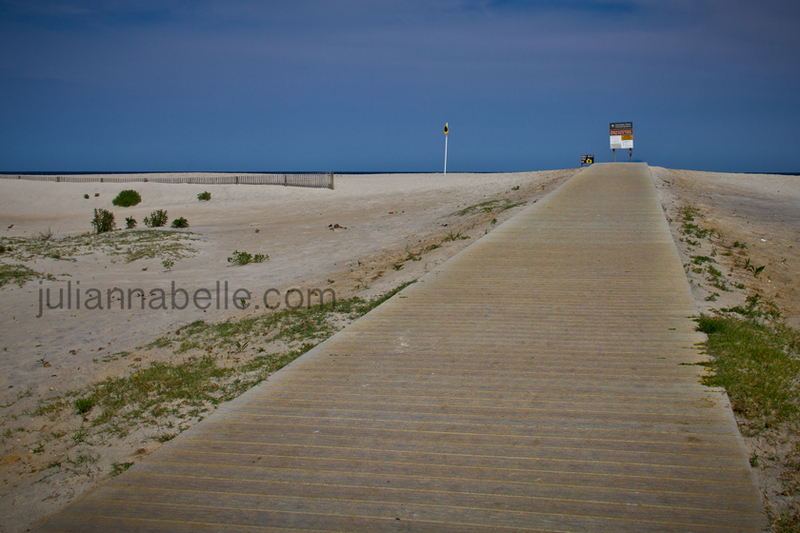 Assateague was a nice beach. No rip currents either. 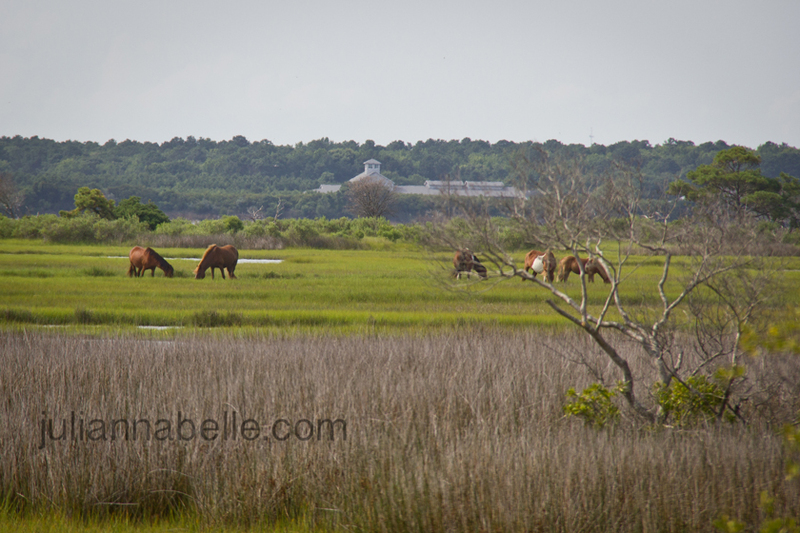 Tons of big open areas there at Assateague! Loved it! 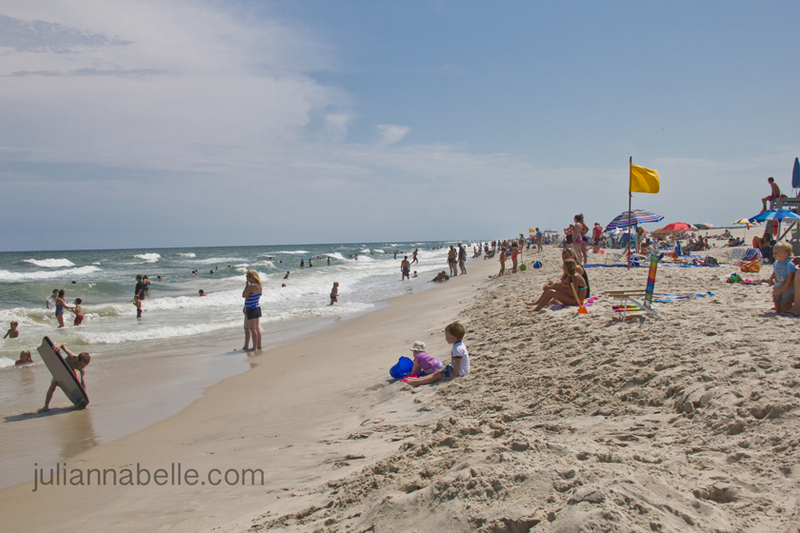 Not crowded like the Ocean City Beaches were! She was DONE at this point. I put her down after our trek from the sand to the boardwalk... and she RAN for the car. RAN. Is my kid the only one that hates sand?? She liked it last year.... Maybe this will change next year. Ponies! They roam free here - so amazing! 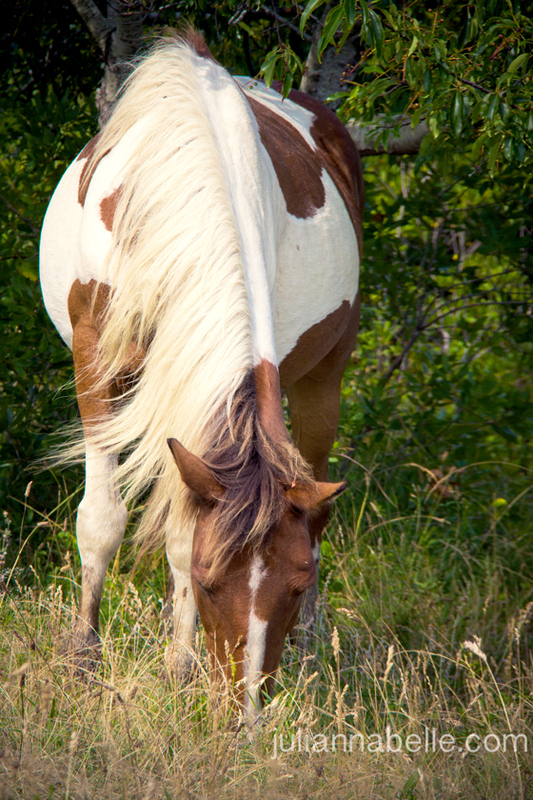 Then on our way out of Assateague, we got lucky enough to see a few ponies on the side of the road and swung over to take some pictures. We lucked out because we got there before anyone else spotted them and I had my camera out and ready to go. 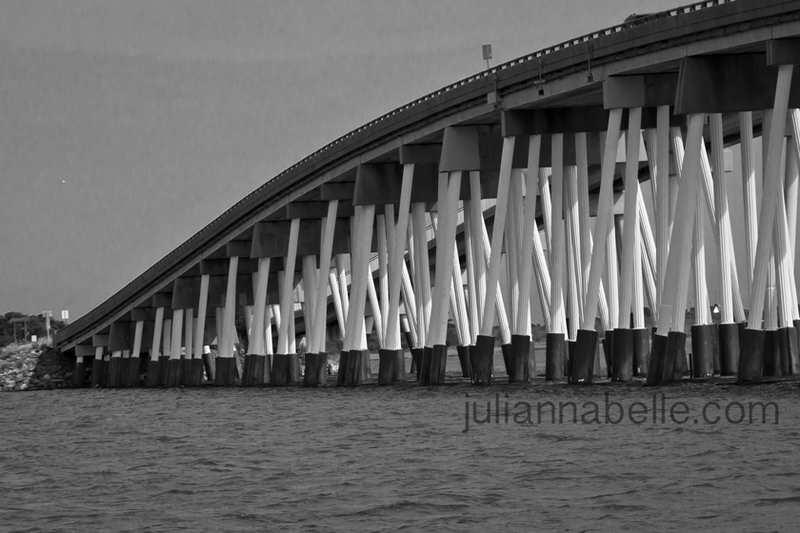 Bridge into and out of Assateague Island. I thought this was kind of a neat bridge because of the lines. Dinner time view from the restaurant. 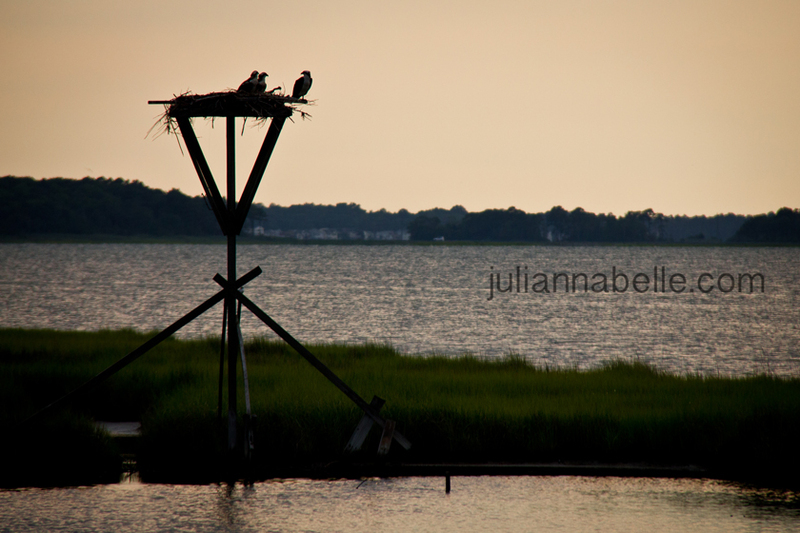 I think these were Ospreys... they were so beautiful! Another view from the restaurant - nice spot to have dinner! I love sunsets! The Canada geese joined the everyone for dinner... looking for scraps. Julianna was saying "Geese Geese" at them. She loves them. View from out condo... we loved sitting out here at night and watching the boats. I can't wait to go back. Julianna polishing off some cherries. Her new favorite fruit! That's all for now. Have a great weekend and I'll post more in a couple days... 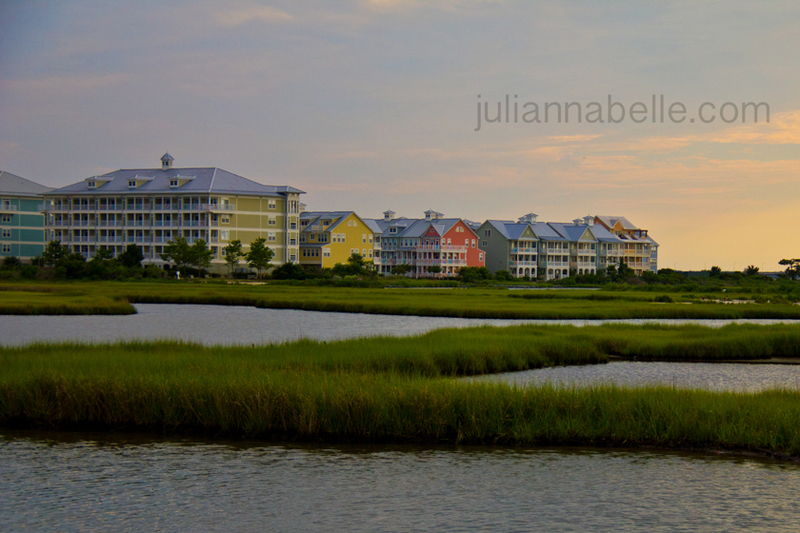 I have more pictures from the beach, the boardwalk and her photo shoot on the boardwalk behind our condo ... stay tuned! All beautiful pictures. Your getting really good at your picture taking! Great pictures Skye. Brooke was fine with the sand earlier this year. But then we went for Father's Day and the same thing. But Liam who hated the sand earlier this year, didn't mind it. I am glad you had a great time. Glad to hear I am not the only one Jen.... very frustrating to keep her ou of the sand on the beach to prevent full meltdown LOL. I was just telling my husband how I can't wait to take Mason to the ocean some day. But when you live in the middle of the country.. it is a looong trip. So it'll be a few more years probably. You are going to laugh but sandboxes freak me out b/c we have so many wild animals in the woods that I think they might use it as their bathroom LOL. 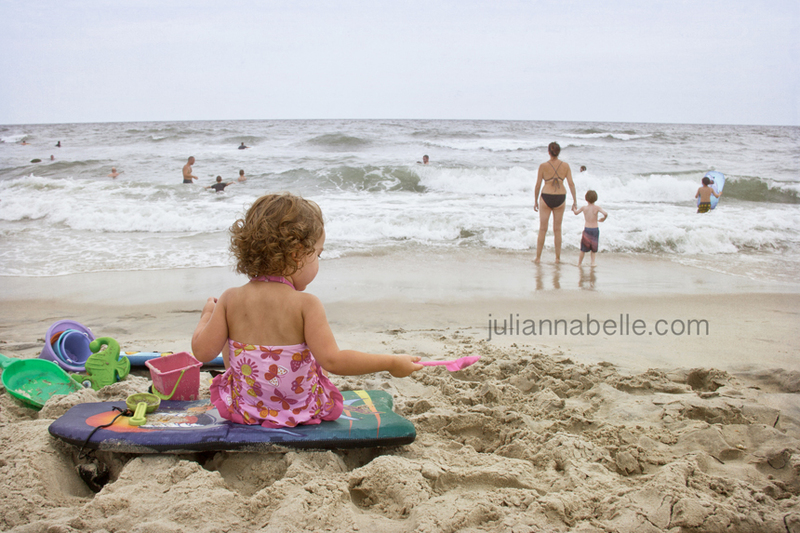 We actually go to the beach quite a bit but this year we just have to be creative as to how to get her to be OK and not melting down … Next weekend we are headed to a local NJ beach and maybe she will do better (one can only hope!). I forget how lucky we are to live by the ocean. It is wonderful – you will need to make sure you guys get Mason to the beach soon – I bet he will love it. He is a fearless boy! He will dive in and eat the sand LOL! :) Have a great weekend! I don't know where to begin, there are too many great pis in this post! Our little ones are VERY similar! Not only when I see pictures of her do they remind me of Alivia but apparently they act the same too! Alivia absolutely hates the sand. She has a meltdown if I try and put her in it. I set up a BIG beach towel and her own little beach chair just so she doesn't have to touch the sand. And there is no way that you can take her shoes off! She'd freak out! I hear this is VERY normal and that eventually they grow out of it. I try to take off Alivia's shoes when I can so that she gets used to different textures on her feet. We finally were able to get her to enjoy the grass under her tootsies by the second to last day of our Cape Cod vacation :o) Yay for progress! She also just walked on pavement for the first time barefoot at my sister's house. I'm hopeful! Hey – thank you! I have more coming soon hopefully tomorrow… if I can get my act in gear and create the post haha! You are right, when I read your blog, I think how Alivia is doing such similar things that Julianna is – so awesome! 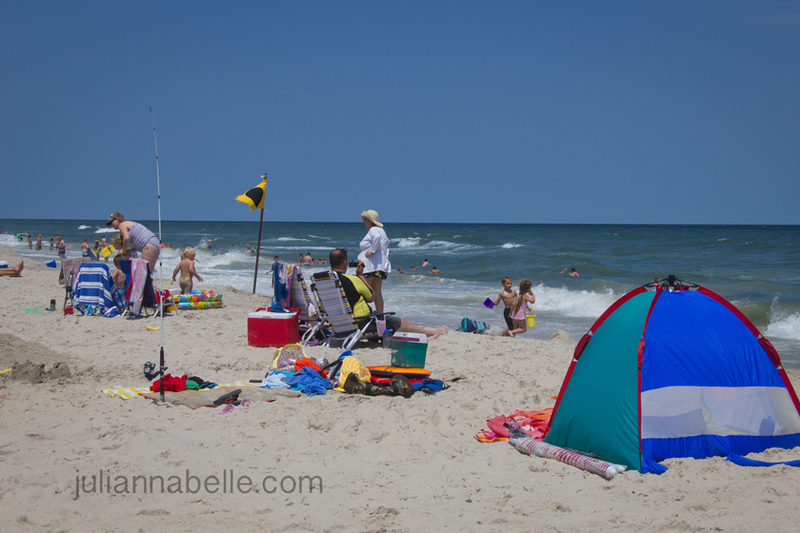 And I am cracking up about the sand – because at least I know I am not alone and it's not just our OCD child LOL! It's funny in a sense but stinks because we have to prepare big time in order to go to the beach. We are going this weekend and we need to bring the chairs, blankets, etc etc so her feet or hands don't touch the sand – ohh boy! One night on vacation we went to this place that had a playground in the sand, and she refused to go play (which she normally loves playgrounds!) and she sat on my lap on the chair in the sand watching the other kids play. But I am truly hopeful she will grow out of this – she is ok being barefoot on floors inside or even the deck, etc… just not the darned sand and not the grass yet either, like Alivia – haha! I have family that live in Montana and there is a Wild Horse Island there, that has wild horses on it. I always loved seeing them, we would go every single summer! 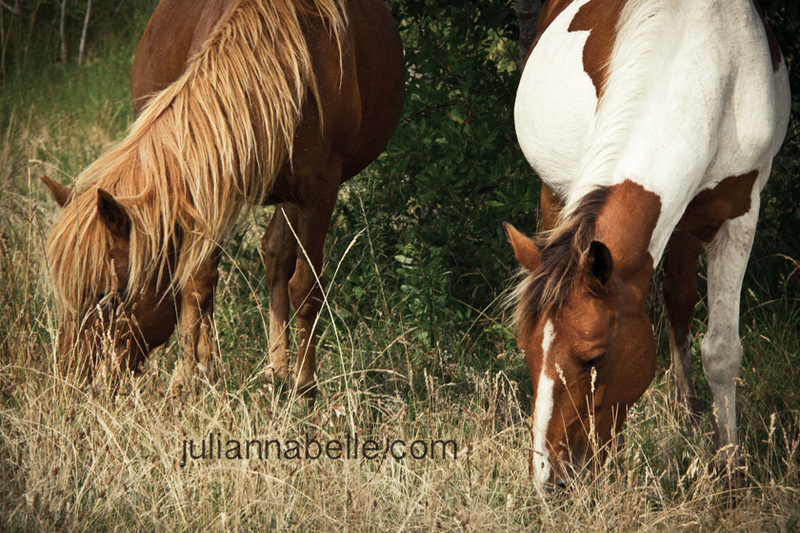 I just love horses- wild or in a farm, etc... they are such beautiful creatures! And I have heard Montana is gorgeous - I would love to visit there. I picture it being like a huge farm with rolling hills and horses as far as the eye can see!